I graduated with my master's degree in early childhood education last Sunday. YAY!!!! Talk about lifting a huge weight off of my shoulders. No more going to class, discussion board posts, staying up until all hours of the morning writing a paper or cramming for a test. Let me tell you, this girl could not be any happier! 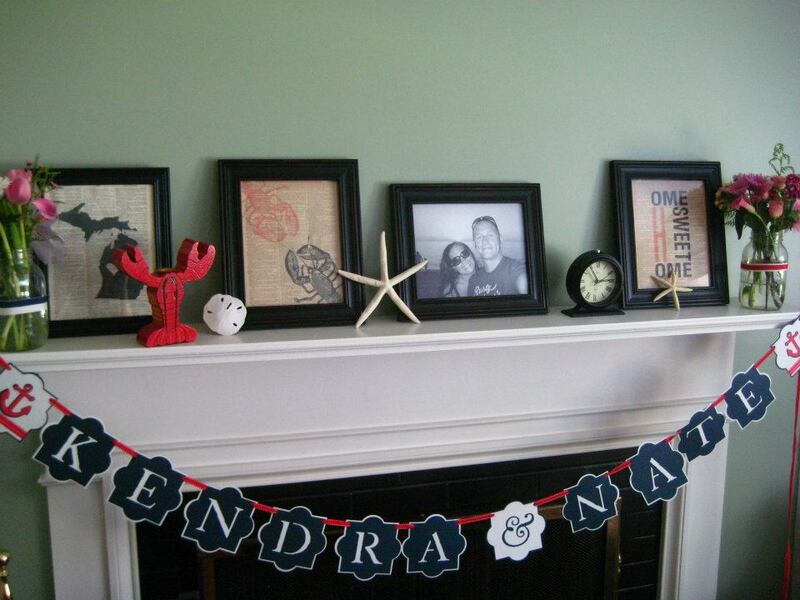 Also, I threw a bridal shower for my best friend in the whole wide world, Kendra. It was SO much work and SO much fun. I was so happy with the way it turned out. 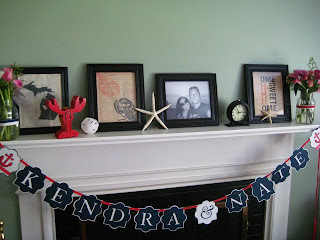 They are getting hitched right on the ocean in Maine (our home state) this summer, so we ran with the nautical theme. Kendra and I are both mildly obsessed with lobsters, so there were plenty of lobsters thrown in there too! 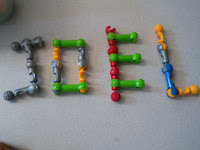 Personalized water bottles... quite possibly my new favorite party idea (and super easy, too!). I am kind of obsessed with this banner! I found a similar one on pinterest, emailed the blogger who created one and she made one especially for me! 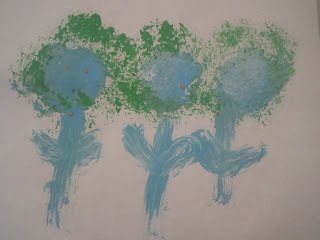 Painting with vegetables. 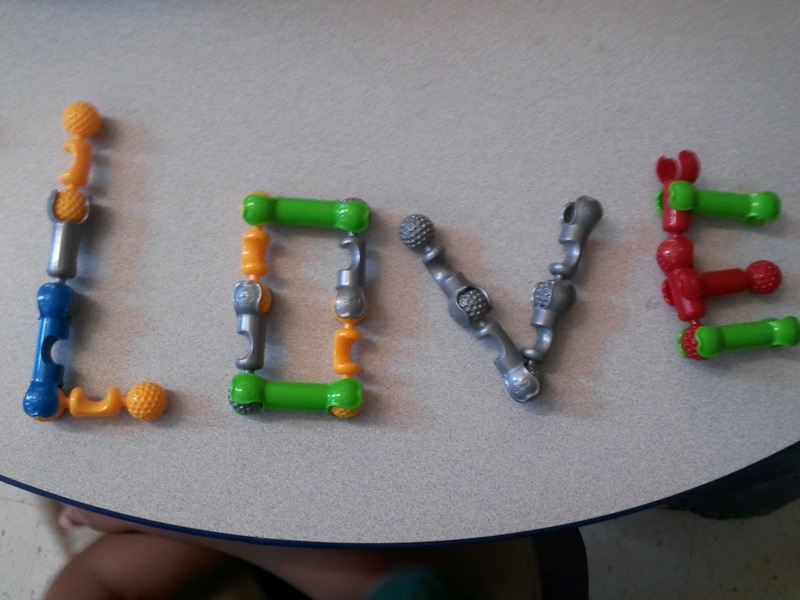 We are learning about "Things that Grow" and reading The Ugly Vegetables, so this was a perfect (and easy) art center. I wish I had taken a picture before they got their little hands all over the paint and vegetables. I literally just saved scraps of the stir fry that I had cooked the night before: carrots, a red pepper, broccoli, scallions, celery and a few other veggies. We also threw in a pear that someone had brought for lunch and didn't eat. I folded up a few paper towels and coated them with tempera paint (not too much!). 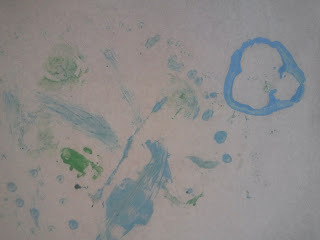 The kids then used them like ink pads, dipping them into the paint and stamping them onto the paper. They loved it (at least until the scallion and pepper started to get stinky), and I loved how easy it was. 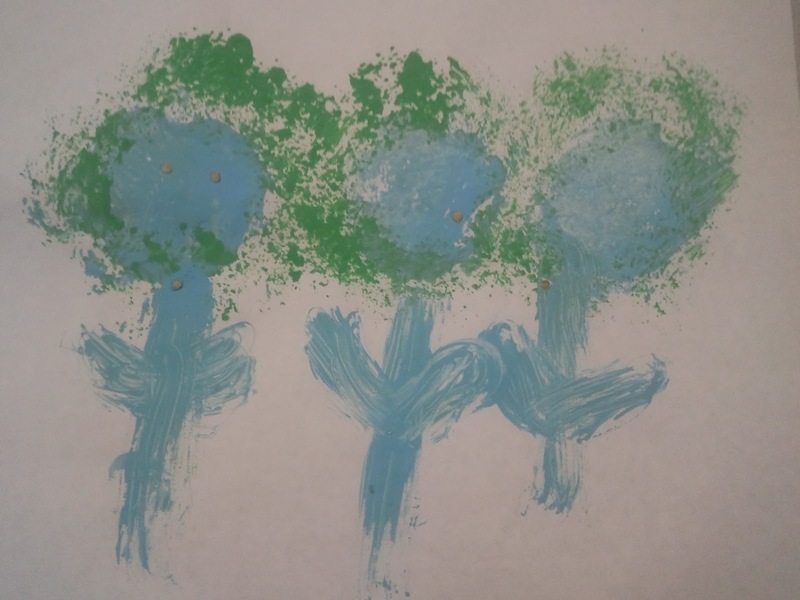 Flowers created with pears and broccoli. 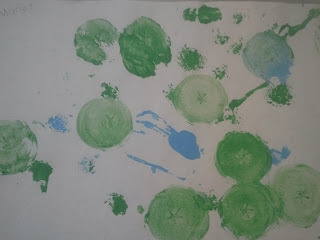 The kids loved how the broccoli made swishy marks on the paper. Also, did you notice that she stuck little seeds from the red peppers in the middle? A red pepper and scallion polka dots, with a few celery swirls. 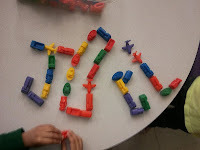 We also got a Donor's Choose project called "Kindergarten Architects want to Build!" funded, and all kinds of great materials came. So exciting! This is such a fun way to combine math, fine motor and literacy!